A kitchen equipped with Wolf appliances is a kitchen built to be used. Born in commercial restaurants, Wolf delivers consistently delicious results through an innovative suite of versatile, hardworking (and forward thinking) appliances. It’s as simple as putting the control – and the confidence – in the hands of our cooks. Wolf exists to build confidence in every level of cook through delivering delicious results every time. How? By eliminating the guesswork through precise heat control, predictable, consistent temperature, and easy-to-use technology. To provide the best Wolf repair to the Twin Cities, Western Wisconsin, and Northern Iowa, Wolf relies on the experts at Thomas Service Company, their Premier Partner for Factory Certified Service. 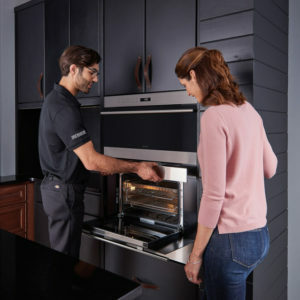 Whether your Wolf appliance is still under warranty or has decades of exceptional performance behind it, Thomas Service Company has the training and commitment to quality required to service these luxury appliances. Our commitment to customers is what drives us. Lifestyles and schedules have become more complicated and hectic since we opened in 1947, so we value your time more than ever. We continue to change the way we work with our customers when scheduling to make our visit as convenient as possible. Our goal remains to repair your Wolf cooking appliances the first time, every time. If problems arise, we commit to standing behind our work and will work with you to resolve the issue. Our Factory Certified Technicians can handle all of your Wolf repair needs. Wolf regularly trains our authorized technicians on-site to keep them current with all the cutting-edge technology and new product development. Please visit our Meet Our Staff page. There you will have the opportunity to learn more about our Factory Certified Technicians before they come to service your Wolf ranges, ovens, or other. We use only Wolf Factory Certified Parts, which come with a 1-year guarantee from Wolf. Our trucks are fully stocked with these factory replacement parts to increase our ability to complete the repair on the first trip. Superior workmanship and the friendliest customer service, all from a team you can trust. We are Thomas Service Company Inc.